As summer slowly gives way to cooler weather, our thoughts turn from beaches to backyards, and a perennial predicament: how to deal with all the fallen leaves. 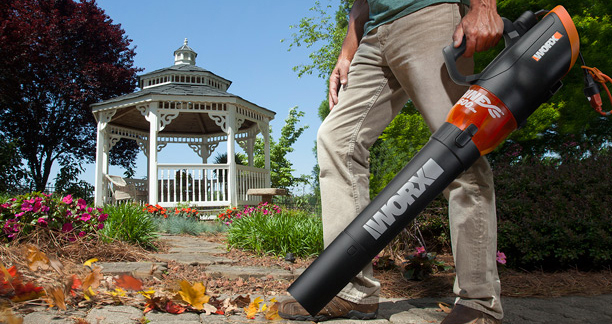 This autumn, forsake the rake and amp up the power with a reliable electric leaf blower from WORX. Here, I’ll review two high-performance models: WORX Turbine Fusion (Item WG510; $90), which is a combination leaf blower, mulcher, and vacuum, and the WORX Turbine 600 Leaf Blower (Item WG520; $60). The Turbine Fusion is an all-in-one machine that makes yard cleanup quick and easy. It can be used for leaf blowing, vacuuming and mulching. It’s driven by a powerful two-speed, 12-amp electric motor and features turbine-fan technology that produces wind speeds up to 60 mph, and has an impressive airflow rating of 565 cfm (cubic feet per minute). That all equates to more than enough power to turbo-blast massive amounts of leaves across lawns, driveways, patios and walkways (as shown above). The Turbine Fusion is equipped with a dual-stage, all-metal impeller that vacuums up and pulverizes leaves and lawn debris into super-fine mulch in a matter of seconds (as shown below). In fact, it’s so proficient at leaf mulching it has an industry-leading mulch ratio of 24:1, meaning it’ll reduce 24 bags of leaves into a single bag of mulch. How amazing is that? And to make vacuuming easier, consider getting the optional WORX Leaf Pro Universal Collection System with Turbine Adapter (as shown below). This cleverly designed accessory (Item WA4057; $40) allows you to blow mulched leaves directly into a trashcan. It includes an 8-ft. flexible, no-kink hose, and adjustable cloth hood that securely attaches to round trashcans ranging in size from 32 to 96 gallons. Looking for a lightweight, affordable electric leaf blower that has enough power to blast leaves off lawns, patios and other outdoor surfaces? Then your search is over: the WORX Turbine 600 is a perfect combination of power, portability and price. It’s equipped with a 12-amp, variable-speed motor and hyper-stream nozzle for producing winds up to 110 mph with an airflow rating of 600 cfm. It weighs just a bit over 6 lbs., so you can comfortably use it one-handed (as shown below). And the variable-speed thumbwheel allows you to adjust the airflow to suit the job at hand: crank it up to blast away leaves and grass clippings, turn it down when working around delicate flowerbeds and gardens. For more information on the entire line of WORX leaf blowers and mulchers—there are nearly two dozen models—go to www.worx.com. Dig deep into the latest news & trends in gardening and lawn care, get your hands dirty with DIY tips, and find out how to make it all happen with the latest WORX tools.